I have lots of childhood memories of getting stung by stinging nettle – I grew up in Germany and the stuff is seemingly everywhere! Being the adventurous, outdoor-loving child that I was, getting stung was just inevitable. But in spite of its viciously stinging tendencies, stinging nettle is one of nature’s powerhouse herbs and well worth the effort of harvesting. The leaves, stems and roots of the stinging nettle plant all have medicinal value. In this post we’ll be focusing on how to harvest and store the leaves. Stinging nettle is rich in vitamins A, C, D, K, as well as B complex vitamins, and it’s also rich in many minerals including iron, calcium, potassium, magnesium, manganese, phosphorous, iodine, sulfur, silicon and silica. Nettle has been used for centuries to treat a wide variety of conditions. Some uses include: To detoxify the body, boost immune health, improve energy levels, increase circulation, improve metabolic efficiency, treat anemia, relieve arthritis, rheumatism, and muscular pain, manage menstruation, minimize menopausal symptoms, regulate hormonal activity, promote lactation, stimulate hair growth, treat bladder infections, treat enlarged prostates, regulate blood sugar in diabetics, protect gallbladder and kidney health, treat gingivitis, provide asthma relief, treat hemorrhoids, relieve water retention, increase muscle mass, lower inflammation, prevent hay fever symptoms, heal skin conditions (e.g., acne and prevent bacterial infections), improve respiratory conditions, and lower blood pressure. That’s a long list! 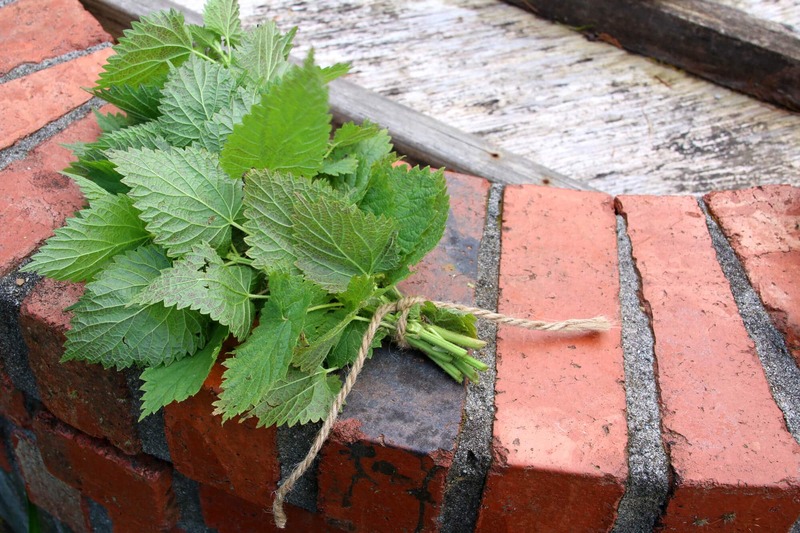 Compresses made with nettle tea or powdered dried nettles are also used to treat wounds, burns, warts and stings. Stinging nettle is also an herb commonly found in skin and hair products because of its high silica and sulfur content; nettle is known to make your skin clearer and your hair shinier. Stinging nettle is also exceptionally high in protein, more than any other vegetable! And as a direct comparison between nettle and spinach, 10 grams of raw nettle contains 290 milligrams of calcium and 86 milligrams of magnesium whereas 10 grams of raw spinach has 10 milligrams of calcium and 8 milligrams of magnesium. Convinced yet? For a high-protein, low-calorie food source that’s packed full of nutrients, vitamins and minerals, stinging nettle is virtually unbeatable. Frankly, if it weren’t for the fact that they sting and thus make harvesting more challenging than other leafy greens, stinging nettle would be available in every grocery store’s produce aisle (you can find them now at some farmer’s markets). And it would probably be far more popular among health nuts than kale is for its superior nutritional value. So let’s talk about its culinary uses for a moment. Stinging nettle has a similar flavor to spinach and can be used as a direct substitute for any recipe calling for spinach. And don’t worry – once the leaves have been cooked, crushed or dried they lose their sting. You can sauté stinging nettle, add it to smoothies, juice it, add it to pasta dishes like lasagna, puree it for pesto, add it soups, stews, in omelets, or include it in salads. You can even add it to baked bread or muffins. And don’t worry – once stinging nettle has been cooked, crushed or dried it loses its sting. Stinging nettle is native to Europe, Asia, northern Africa, and western North America, and has also been introduced to other areas. Stinging nettle grows from the early spring through summer and can grow to be between 3 to 7 feet tall with leaves from 1 to 6 inches long. The stems and leaves are very hairy and most subspecies of nettle have hairs that sting by break off the leaf when touched and injecting chemicals into the skin that burns. Nettle thrives especially in areas with a good amount of rainfall and in moist soil. It’s commonly found in the countryside, near forests and river banks. 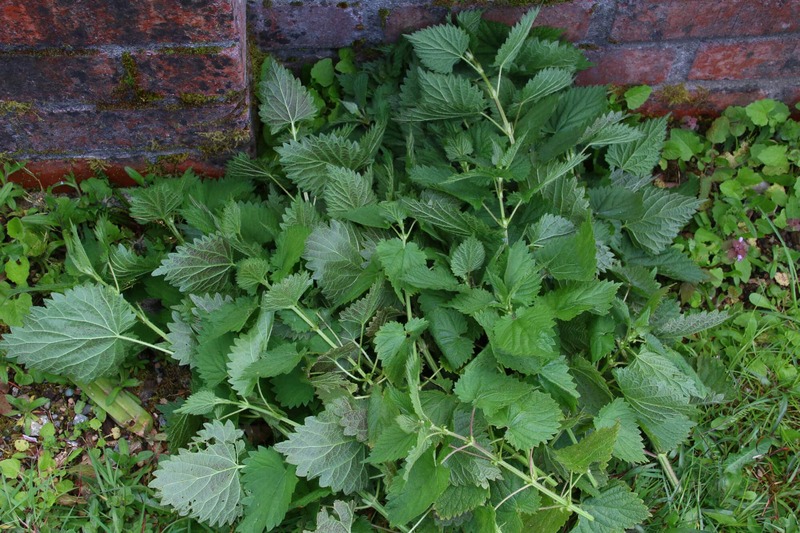 Below are a few pictures of stinging nettle on our property to help you identify them. It is recommended that you wear gloves and long sleeves when harvesting stinging nettle. Keep the gloves on while you’re preparing the nettles as well. The leaves, stems and roots can all be used but we’re going to focus on the leaves and stems. 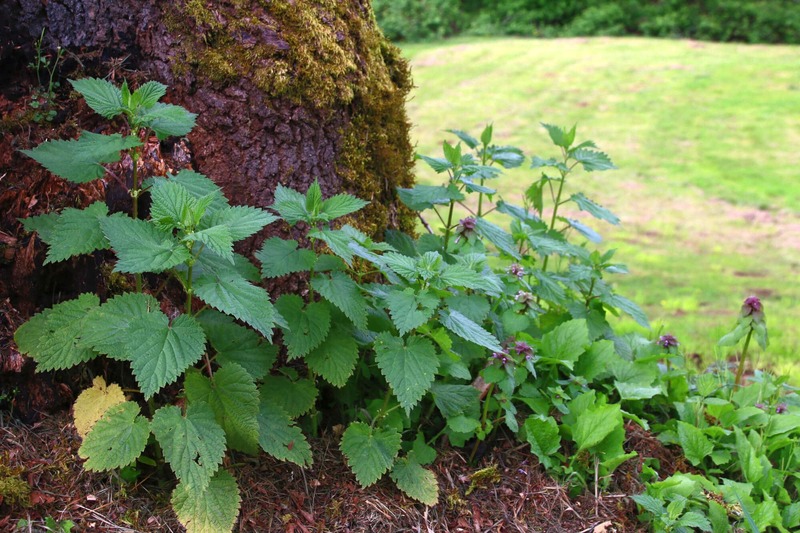 Stinging nettle grows from early spring through the summer. The best time to harvest them is while they’re still a small, no more than a foot tall, because that’s when the leaves are the most tender. The leaves are best harvested while they’re still young and before the plant starts flowering. Once it flowers the leaves become bitter and some argue (though that’s disputed) that they contain cystoliths which may irritate your kidneys. 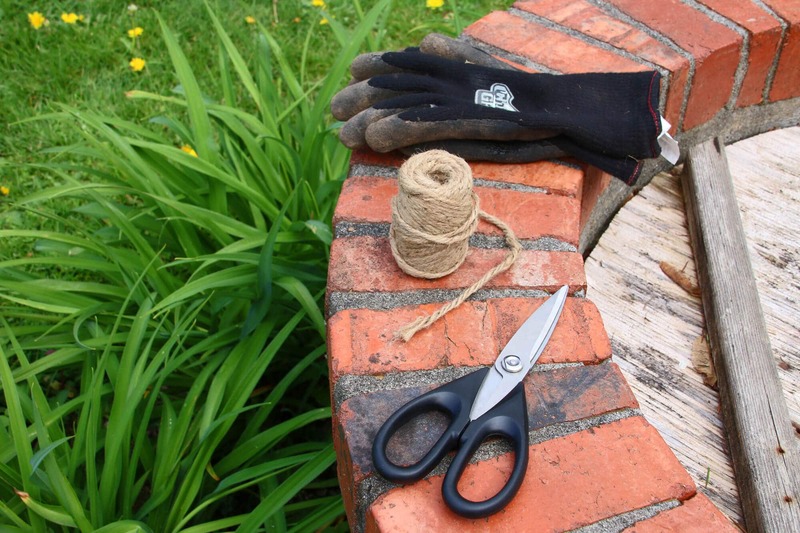 Use scissors to snip off the top 4 inches of the nettle plant. This will allow the plant to continue growing for later harvesting. Wash the area with soap and water to remove the nettle hairs. Alternatively, some recommend sticking scotch tape to your skin and pulling it off to remove the hairs. Apply a paste of baking soda and water. Avoid scratching or rubbing the affected areas. Interestingly, whenever you find stinging nettle you’ll also very often find another plant growing close within its vicinity: Dock. The reason that’s interesting is because in folk medicine dock has traditionally been used as the antidote for nettle stings. The reason it’s claimed to work is because the substance in stinging nettle that makes it sting is formic acid, and dock leaves contain an alkaline substance that neutralizes the acid in the nettles. To treat the sting you simply take a dock leaf, crush it with your hands and then rub it, vein side down, over the affected area. 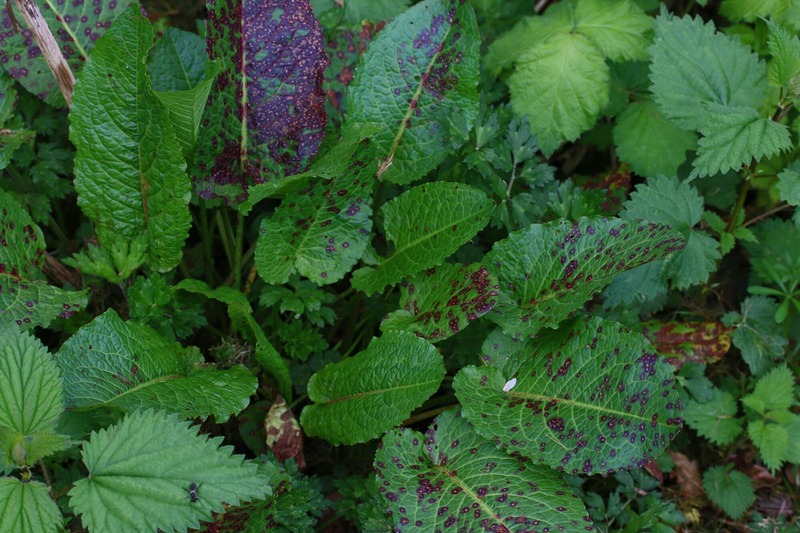 Below is a picture of a dock plant on our property and you’ll notice it’s surrounded by stinging nettle. 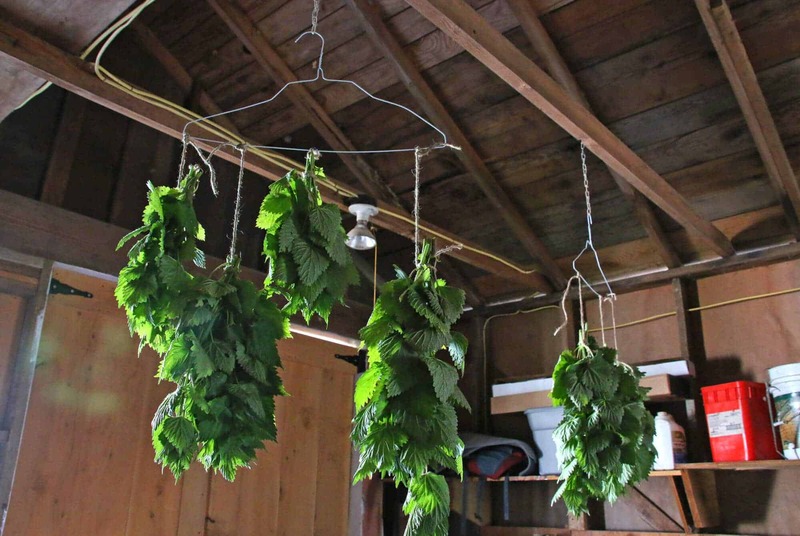 There are several ways you can store nettle. You can tie them in clusters and hang them upside-down to dry in a dry place. You can also dry the leaves in a food dehydrator: Give them a rinse, pat dry with paper towels and let them air dry for a few minutes before placing the leaves in single layer on the drying racks, leaving adequate space between the leaves for air circulation. Dehydrate the leaves for 8-10 hours or until they are completely dry, otherwise they’ll form mold. Store the dried leaves in an airtight container. You can store the leaves fresh (and unwashed) in ziplock bags or airtight containers in the refrigerator for at least 3 days and pull them out, wash and use as needed. The leaves can also be frozen. You can blanch the leaves in boiling water for a couple of minutes followed by placing them in a bowl of ice water to cool down; squeeze out the excess liquid and spread the leaves out on a cookie sheet and freeze them. Once frozen, store the leaves in a vacuum-sealed bag or ziplock bag. Instead of blanching you can instead steam the leaves for a few minutes and then follow the same process. Of the two methods I prefer steaming because many of the nutrients will be lost in the water during boiling. Alternatively, you can also steam, puree and freeze the nettle puree in ice cube trays. Then simply pop the cubes into soups, stews, dips or use for pesto. 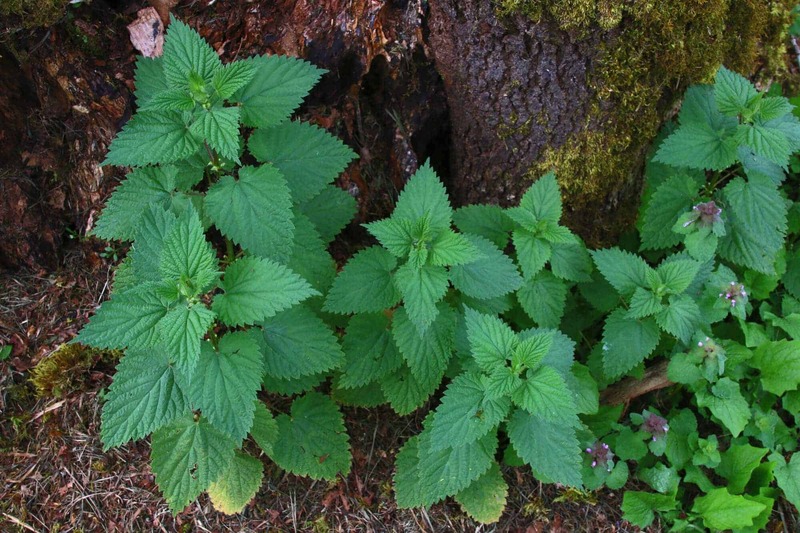 See the section above to learn about nettles’ versatile culinary applications. 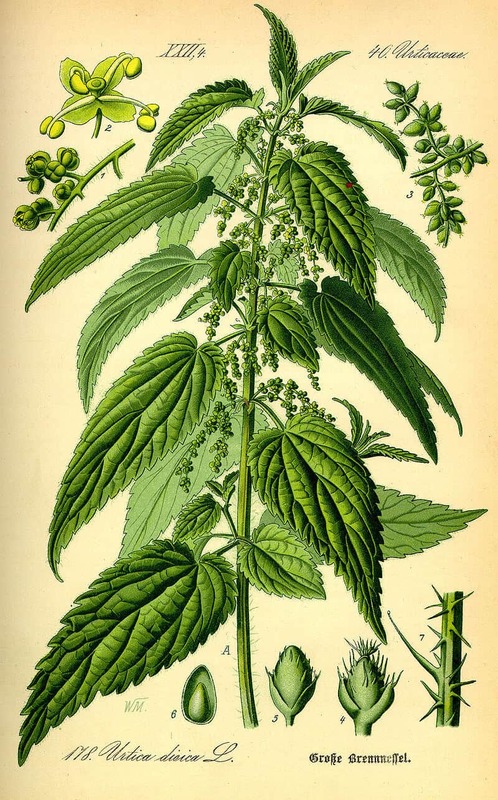 Nettle can be used to make tinctures to treat the various conditions we discussed earlier. It can also be ground from dried leaves, stems and roots into a powder and made into capsules. But the easiest way to prepare nettle for hair & skin health and medicinal purposes is to make a hair tonic, skin toner and nettle tea. Bring the water to a boil and pour it over the leaves. Let it steep for a few hours and until completely cool. Strain the tonic, discard the leaves, add a few drops of essential oils and place the tonic in a bottle. Store it in a cool, dark place or in the refrigerator for a few months. To use it, pour some over your hair in the shower and massage it in. You can rinse it out if you prefer or, for a more potent effect, leave it in and air- or blow dry as usual. Alternatively, you can add the tonic to a spray bottle and spray it on your hair, massaging it into the roots and then letting your hair dry as usual. Use daily or a few times a week for healthy, shiny hair. Place the nettle leaves and water in a small saucepan and bring to a boil. Remove from heat and allow to cool completely or the course of a few hours. Strain the water and discard the nettle leaves. Stir in the witch hazel. Pour the toner into a bottle and store in a dark, cool place or in the refrigerator (makes it even more refreshing) for a few months. To use it, apply it to your face with a cotton ball. Do not rinse. Use daily or as needed for bright, healthy skin and/or to treat acne. If using fresh leaves, boil them in the water for 10-15 minutes. If using dried leaves pour the boiling water over them and steep for 15-20 minutes. Strain the tea and it’s ready to drink. You can add sweetener if you like. Nettle has a very wide medicinal application, see the Benefits section. Drink the tea one or more times a day as an overall health tonic. To help prevent seasonal allergies, it’s recommended to start drinking 2-3 cups of tea daily for about three months before the allergy season begins. Similar to a tea, you can also prepare an infusion which is stronger in strength and can be sipped each day. WHAT ARE YOUR FAVORITE WAYS TO USE NETTLE? Please share! Disclosure: To ensure safety and selection of the correct plant, refer to diagrams and descriptions from a reputable plant identification guide. So very interesting! I’ve never cooked with nettle! I never knew nettles could have so many applications! Thanks for the tips! This is great…I never would have thought to cook with stinging nettle. I’ll keep my eyes out in the woods and my yard now. I loved learning about this! Great post! Someone gave me the seeds for a non stinging nettle years ago. 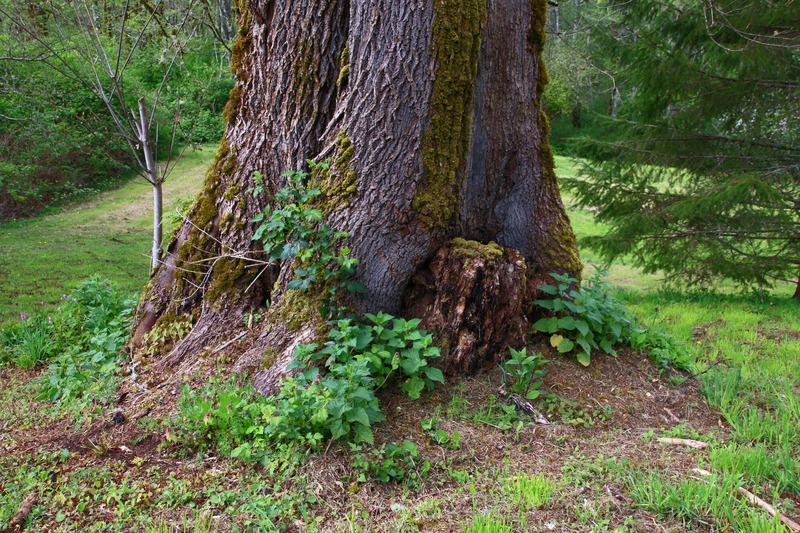 It was once used a lot In land restoration. It is more common than stinging nettle here in central Ohio. I should use it more. It is weedy. 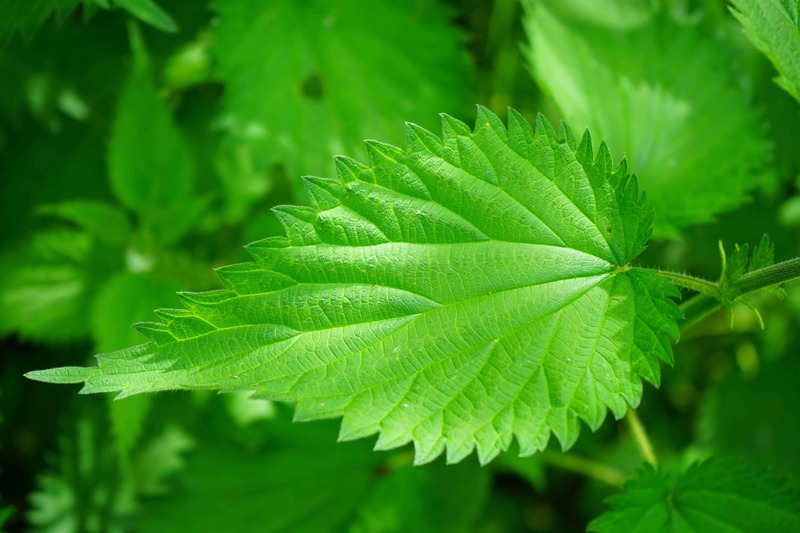 Some people used the stinging nettle on their skin to help with certain kinds of pain. I have never tried it. Thanks for highlighting Nettles. 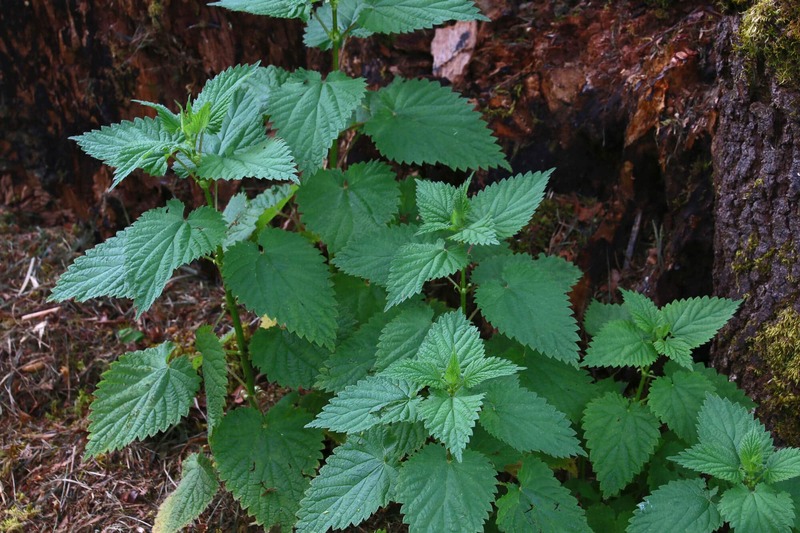 Growing up in Western Washington my family had nettles on our land and would harvest them during the spring and use like you mention. A couple of other things I’ve found over the years is that the top of the leaves do not sting, so if you hold them by the top of a leaf do not worry. Also in the Northwest another plant that grows near nettle patches is the Bracken fern. When its in its fiddle head stage to the point the leaves don’t have any curls can also be use as antidote to the nettles stinging. Just rub the fern curls on the bites and the juice from the fern will cure the stinging. Thanks for this article. I really liked the idea of freezing batches especially purees in ice cube trays. We have a lot of stinging nettle along our pasture fence lines. I never treat it as a weed to get rid of, but instead use it in recipes (mostly quiches and omelets) and then dry it for my sheep to have as treats during winter months. The 1st time I cooked with it I was surprised at how filling it was and how it sustained me between meals! Thanks for sharing, Ruth! What a fantastic treat for your sheep. I’m getting ready to harvest some to dry for our pet rabbit :) Speaking of farm animals, we just got some chickens a few weeks ago and would really like to raise a few sheep but everyone tells us they’re way too difficult to keep safe in our area (coyotes and dogs mostly). And we’re not ready to build a massive fence around the area – maybe someday in the future. As young children my mother had my brother & I pick stinging nettles, so she could cook it for my father to eat. He came home after world war 2 with medical problems, one being intestinal, and that is what she would cook for him. Spinach was not available at that time, that is why we would use the nettles instead. Needless to say he recouperarted fully and lived a long life. Thank you for all the information, I wasn’t aware of. That’s a remarkable story, Helga, thank you so much for sharing. Love, love, love nettles! We mix with homemade ricotta cheese and lemon and use as a bruschetta topping. So good. 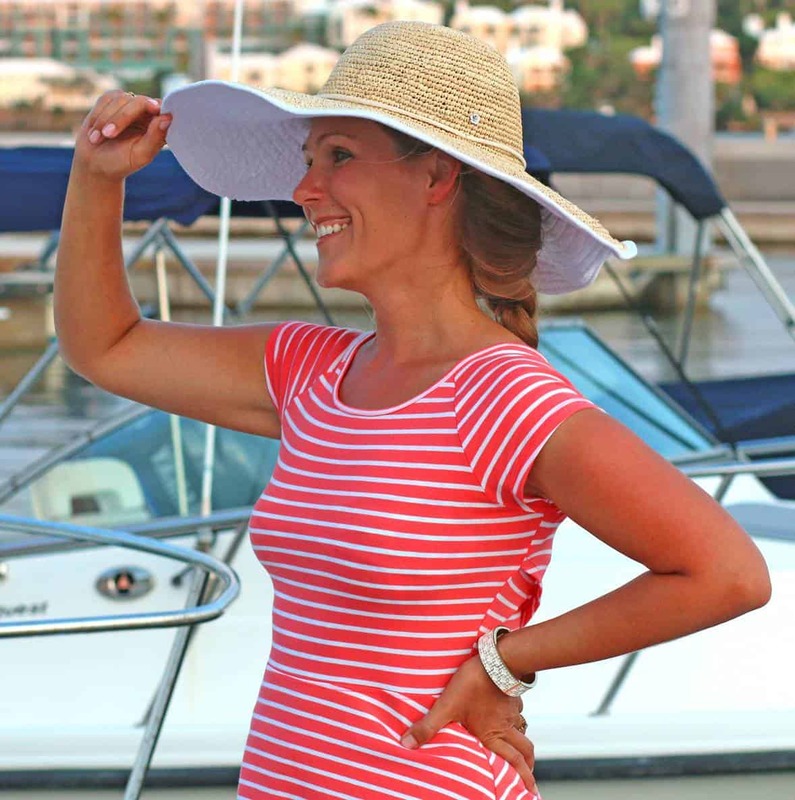 Can’t wait for spring! Dreaming of this and dandelion salads and tempura dandelion flowers! That sounds heavenly, Stephanie, I’ll have to try that, thanks for sharing! I want to use nettles and I am a beginning homesteading mom but I am weary on nettles too! It’s hard to come to using them, I’m so afraid that they will keep their sting! I have some of these plants growing all over my flower garden. But I’m not 100% that they are a form of nettle. Could you help me identify it. english plantain grows near poison ivy and relieves symptoms of itching and redness.